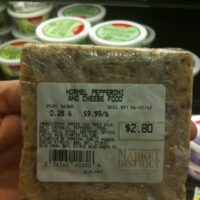 We found this pepperoni and “cheese food” in our local grocery store over Memorial Day weekend. If they would have left the word “food” out of the description we probably wouldn’t have given it a second glance. Do you really need to mix the cheese and pepperoni together for me? What if I don’t like your cheese-to-pepperoni ratio? What if I don’t like the quality of the meat-snack that you used? How will I upgrade to a different cheese if I don’t like the one you’ve selected for me? This reminds me of Smucker’s Goober PB & J. For the truly lazy American that can’t be bothered to mix peanut butter and jelly together, we bring you: all-in-one peanut butter and jelly! 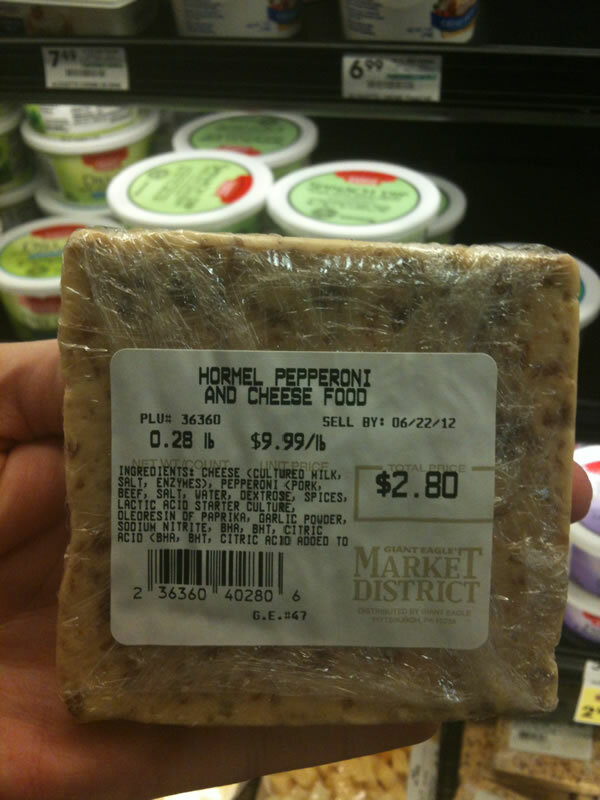 I’ll make my own pepperoni and cheese “food” thank-you-very-much. And I’ll put it on crackers all by myself too.